Since history began people have lived in felt insulated tents. In Mongolia today millions live in yurts and often prefer them to regular homes. The yurt is ideally suited for housing and we have sold many yurts for people to live in full time. There are many reasons our customers choose us to build their home and this includes factors like extra strong waterproofing, durability, low maintenance, expertly insulted amongst others. If you are thinking about living in a yurt then take advantage of our expertise and have us work with you to design and build your dream yurt home. We have many satisfied customers who can't thank us enough for helping to make their perfect home. Whatever your plans, whatever ideas you have we can help. Below are a few examples of the homes we have designed and supplied. Celia and David bought a yurt from us 2 years ago and recently visited to order a sun cover for their home. We popped over to measure up and see how they were doing and meet the new baby who was born in the yurt a few months earlier. They both were full of praise for our work and very pleased that they had bought a quality yurt, unlike some of their friends whose yurts are in a sorry state. In fact, they love the yurt so much they are going to order a second one. 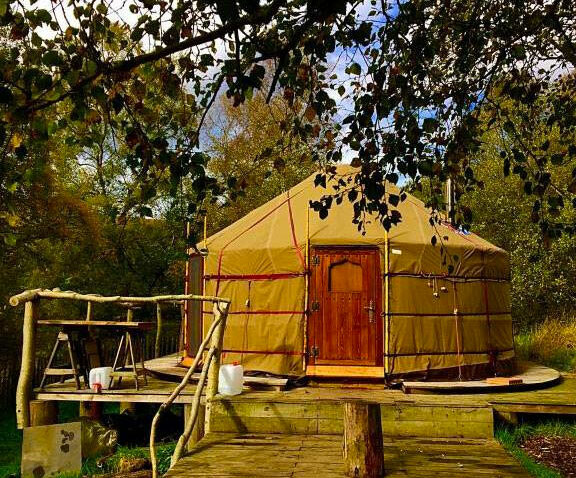 Analise lives in a beautiful area of Belgium and rather than spend money on a mortgage she opted for a custom yurt complex. After visiting us to discuss her needs we designed and built a spacious 21-foot central living space with 10-foot pod as her main bedroom. Analise wanted a lot of light in the yurt so we fitted two large windows to catch morning and afternoon sunlight, plus a window in the door and a transparent crown cover. The stove was placed to one side to enable a kitchen to be built around it. The smaller yurt was joined using one of our Yurt-Joins that provides a simple and effective join that can be removed at a later date if the yurts are to be used separately. Needless to say, she is thrilled with her home and despite the immense amount of rainfall in Belgium, she remains warm and dry all year round. Nick is a body therapist and lives in an all year round naturist campsite close to the sea in southern Spain. He approached us with the desire for a comfortable home that could be moved if needed. We designed him a 21 foot home with oak window and door. He loved it so much that he ordered a 11-foot yurt high with wall for his therapy room (see photo). Nick has had over 300 visits from people on the site and we have received visitors from the camp looking to purchase their own home. Recently Nick received another visitor with four legs and a wagging tail who is now enjoying the delights of Nick's new home too.